Nike debuted the KD9 and Hyperdunk 2016 sneakers and their colorways for the Rio Olympics in August. Plan on fully embracing Nike Flyknit and full-length Zoom Air when it comes time for Olympic basketball in Rio this summer. As part of Nike’s massive unveiling of Olympic-related product in Manhattan, we got a look at the new KD9 and Hyperdunk 2016, two sneakers coming at us in full Flyknit and, for the first time, full-length Zoom Air. The low cut KD9, designed by Leo Chang, uses a Flyknit—yarn engineered down to each pixel—upper with a honeycomb pattern for structure to provide stability during the “multidimensional movement of basketball.” By engineering the yarn, Nike says it can cut down on excess material and weight while maximizing strength and allowing the foot to move naturally in a stable environment. The Flyknit goes a bit taller in Hyperdunk 2016. Eight years after the silhouette’s launch ahead of the Beijing Olympics, the ultra-high Flyknit upper was designed by Chang to offer “enhanced locked-in feel.” Embedded Flywire cables in the forefoot accentuate stability while allowing the Flyknit to have zones designed specifically for support, stretch and breathability. 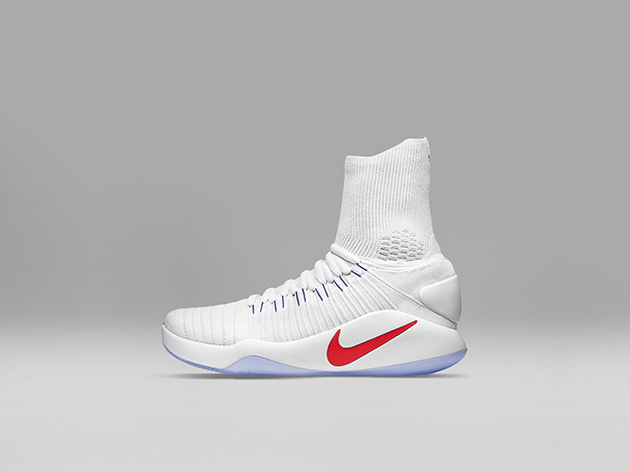 An added heel counter increases stability on the Hyperdunk. 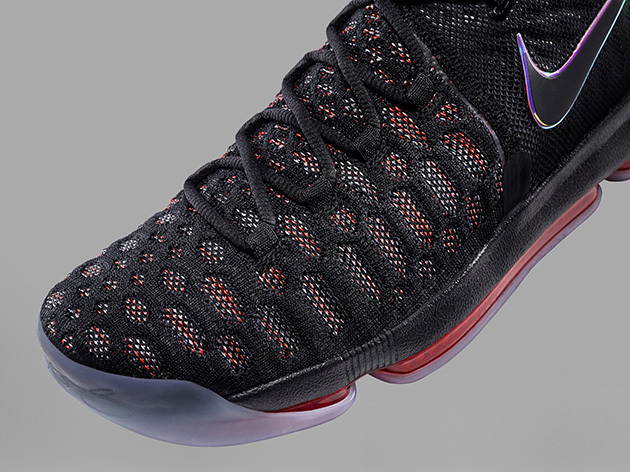 With the uppers situated, both shoes offer full-length Zoom Air units for the first time in Nike basketball. The KD9 uses a visible, tapered unit from heel to toe, a component that took three years of wear testing to solidify. Filled with fibers that compress upon each step before springing back into position, the unit is 16 millimeters thick at the heel and narrows to 10 millimeters at the forefoot, a design meant to balance impact protection with cushioning throughout the length of the foot. 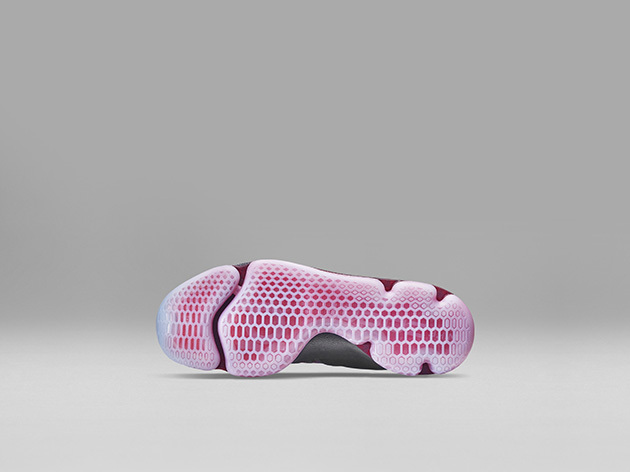 The KD9 includes an anatomical flex groove in the forefoot designed to allow for natural foot movements and heel notches to add stability for lateral movements. 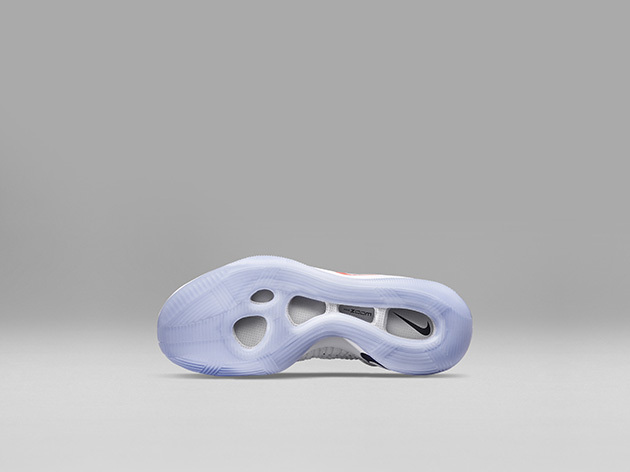 On the Hyperdunk’s Zoom Air unit, which is also full-length, Nike opted for a uniform unit and then created a hollow core between the unit and the outsole—which features herringbone traction—for, as Nike says, greater trampoline effect. Aesthetically, both sneakers get defined by the Flyknit uppers—especially the honeycomb pattern on the KD9—and the underfoot systems, such as the visible Zoom Air on the KD9. With the 2016 Summer Olympics opening ceremony kicking the Games off on Aug. 5, the KD9 launches on June 20 and the Hyperdunk 2016 in July, both in plenty of time for Durant and a full compliment of athletes to don them for the Rio Olympics.